This article was supposed to feature a lengthy article about Robins but circumstances delayed it to the point that it is too late for this year. Robins are already nesting and some even have young. Perhaps next spring. As far as nesting goes we have a good variety of nesting birds in our yard this year. We definitely have Chipping Sparrows, Purple Martins, Tree Swallows, House Sparrows and House Wrens. We also appear to have Yellow Warblers, Brewers Blackbirds and Robins nesting somewhere but I have not found the nests yet. We also have a pair of brown Thrashers and Catbirds regularly visiting our yard. Nesting? The one big surprise is that we have a pair of Chickadees nesting in one of our birdhouses. 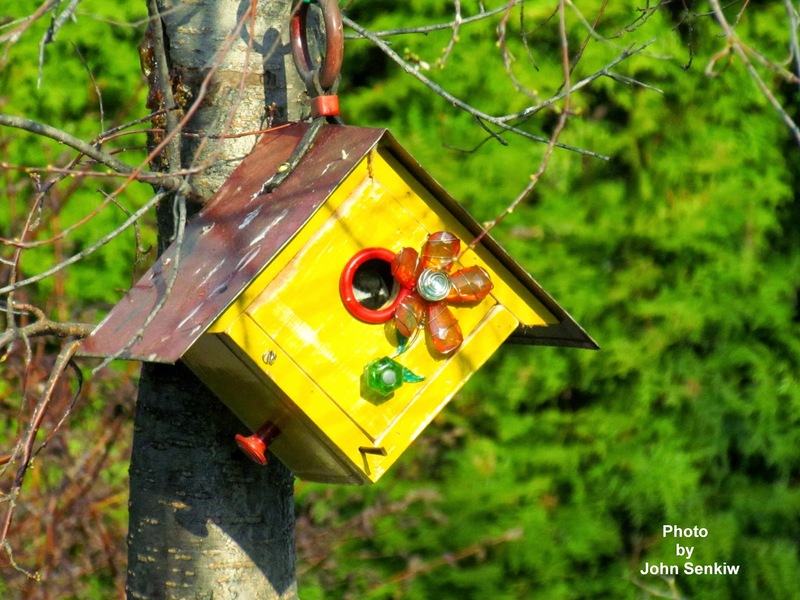 Although many magazine and television articles state that Chickadees will readily nest in birdhouses they seldom do. In addition Chickadees prefer to nest away from man. These Chickadees seem to have broken all the rules. In fact this is the first instance of a Chickadee utilizing a birdhouse that I know of. The nesting process started about three weeks ago with the Chickadees seemingly “testing” the suitability of the birdhouse. This evaluation period was followed by a flurry of activity with the Chickadees carrying nesting material, mostly feathers, into the birdhouse. Our yard work did not seem to bother them. No matter what, it is a pleasant surprise and I hope that they are successful in raising a family. There is nothing as cute as a family of juvenile chickadees flitting in the trees. 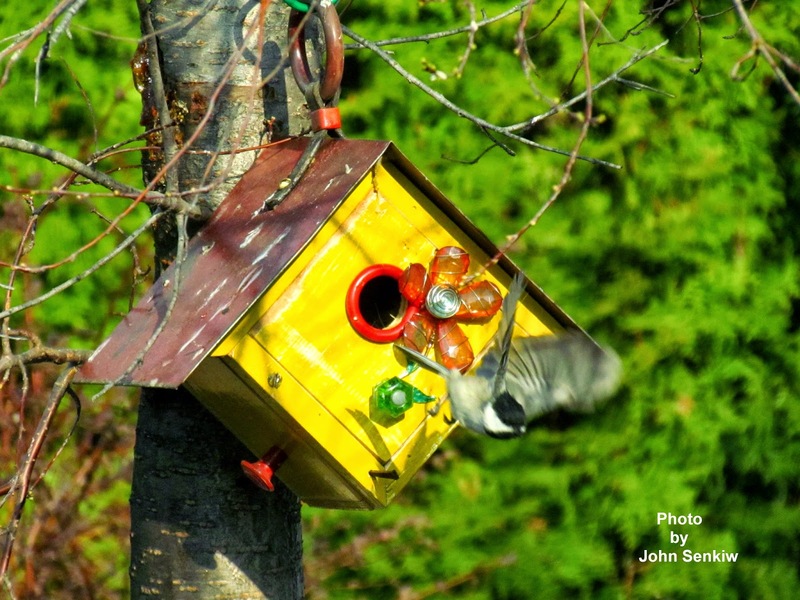 This week’s pictures are of a Chickadee flying out of the birdhouse and another of a Chickadee sitting in the opening and looking out.